The JEE Advance is the second crucial stage for all those who are willing for their selection in Indian Institute of Advance. Latest Update: Online Registration for JEE (Advanced) 2019 is open for FOREIGN NATIONALS ONLY. For registration click here. Latest Update: JEE Advanced 2019 Exam Date has been changed to May 27, 2019, due to the Elections!! Check the table below. As the selection in any of the 23 IITs doesn’t come easy, thus JEE Mains is only segregation exam of the creamy layer whereas the JEE Advanced Exam 2019 brings competition among others. Each year the exam is organized by any of the IITs. Qualifying the exam allots permission to pursue Bachelor’s, Integrated Master’s or Bachelor-Master Dual Degree in Engineering, Sciences or Architecture. The Advance ranks can also be useful for admissions in IISc, IISER, IIST and RGIPT. If you have made up your mind to continue for the exam, going through following details will surely help you while opting for exam. For the complete process of JEE Advanced, it hardly stretches for long time. The exam is soon organized soon after the JEE Main results thus constant preparation for the exam is instructed. The exam of AAT will be conducted in June and the students will be able to check out their results after 4 days. The JEE Advanced 2019 Notification making official announcement of news on exam dates is made available for all through website only. The news is often released in the month of January, thus all waiting contenders can check out JEE Advanced Brochure here earliest after release. 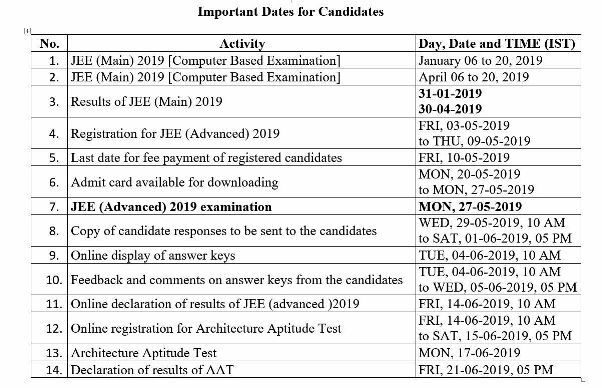 The below mentioned table clearly describes the useful information of JEE Advanced 2019 Conducting IIT, exam dates, eligibility, mock tests and more relevant topics covering glimpses of the exam. The exam will be taken online only. Students scoring above 2,24,000 rank in JEE Mains will be allowed only. Rank: Students who are able to secure their ranks in top 2,24,000 in JEE Mains are eligible to apply for the exam. Attempts: Candidates with more than 2 attempts will not be allowed. 12th Class Appearance: The applicant should have either qualified class 12th first time in 2018 or 2019. Students who will be able to qualify the JEE Advance with a minimum cut of marks will be permitted to appear in the exam. You can also Check our other article to know the complete JEE Advanced Eligibility Criteria. The JEE Advance is registrations will begin soon after AIR ranks for JEE Mains have been announced by the CBSE. The students will have to keep a check on JEE Advanced Registration in the month of May for successful processing of their application. The registration fee has to be submitted online only. Note: The registration for JEE Advance cannot be done if the exam has been attempted already for 2 times. As per the guidelines and instructions mentioned in the JEE Advanced notification, the JEE Advanced 2019 Application Form will be submitted online only. The application submission will be done at the activated portal of JEE Advanced 2019. Before starting your application submission, make sure to be prepared with documents such as: Educational certificates of Class 10th, 12th and category proof certificates (if belonging to reserved category). Following the below mentioned process, it will be easy for all to submit the JEE Advanced Application Form. 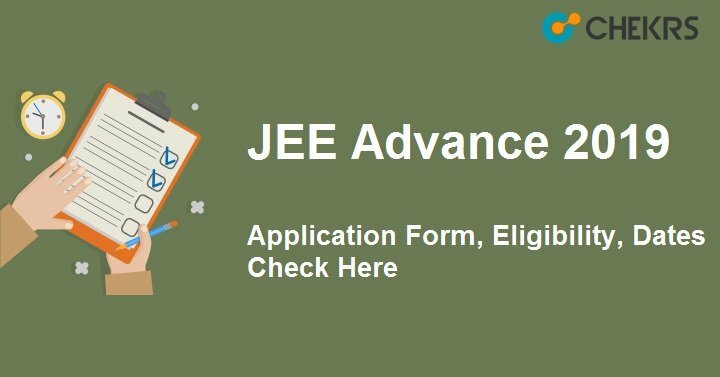 Open the JEE Advanced Website. The home page will show you the link of Registration form where application form. Fill the details in the apt format as asked in the online form. Upload the scanned documents as instructed. Recheck all details and click on submit. Birth certificate, 10th Marksheet is also acceptable for the same. How many times a candidates is allowed to appear in the JEE Advanced Examination? A candidate can appear 2 times for the Exam, But in a consecutive Years. Is there any changes in JEE Advanced 2019? Which IIT will set the paper for JEE Advanced 2019? What will be the Fee for JEE Advanced 2019? What is the age limit for JEE Advanced? According to previous notification, To be eligible, the candidates should have been born on or after October 1, 1993. SC/ ST and PwD category candidates will get a relaxation of 5 years. The complete exam will be online only. Students will have to makes sure they are precise to the point as new questions will appear on the screen soon after time run out. To complete the process of JEE Advanced Exam Pattern, it is mandatory for students to appear in Paper 1 and 2. Applicants would require solving the question paper; 3 hours will be given for each. The exam for the Architectural aspirants will be different. If students once are able to qualify their IIT Advanced Exam only then they can appear in the AAT (Architectural Aptitude Test). The AAT exam paper will be of one paper to be attempted in 3 hours. To qualify the exam with best possible numbers, it is essential for all students to process their study schedule indulging in relevant topics and best books. The JEE Advanced 2019 Syllabus Pdf compiling important topic of Physics, Chemistry and Mathematics will help students to match up to the level of JEE Advance. Whereas, the JEE Advanced AAT Syllabus will be testing applicants for: Freehand drawing, Geometrical Drawing, Three-dimensional perception, Architectural awareness and Imagination and aesthetic sensitivity. The preparation for admissions in IIT itself it a great task as with the levels up, it increases the competition. However, for such important exams apart from tight preparation, a few JEE Advanced Toppers Tips can provide great help to all. The best way to learn all of the sections involve parting time equally and following it. Choose only reliable study material that can promote clear insights of every topic. Understand the topics and make their notes. Practice with JEE Advanced Previous Year Papers. Make short term goal and try to accomplish them first before setting to test for major exam. All in all, it the exam can be a great success when one works with strategy while putting the hard work. The Admit Card will be available in the 3rd week of May 2019, It will be available through the Official Website. Candidates have to visit the official website and there they need to log in, using the login Credentials. After login to the official website, Candidates have to find the link for the Admit Card and then they can download the JEE Advanced Admit card in PDF. JEE Advanced Result will be also released on the official website, Candidates have to visit the official website to check their JEE Advanced 2019 Result and Rank card. The Result will be announced in the month of June 2019. Category Wise All India Rank Card will be also released on the Official website, Candidate can Check their Result and Scores by logging to the official website. As the paper will be MCQ based, students will be able to get the number of right questions answered through the JEE Advance Answer Sheet. The answer key will be published on the website of JEE Advance through. Students can catch up the answer key earliest through the updates given here. Moreover over it is necessary for all if they have any doubts, it ought to be resolved timely. The Exam Authority will release Category Wise All India Rank Card which is an important document you have to find out your rank in the JEE Advanced Rank List. All the qualified candidates will be called for JoSAA Counselling. JoSAA counselling will be organized for all JEE Exams to allot seats into selected institutes/college/ University. After Seat Allotment through JoSAA Counselling, candidates will have to report to the allotted institute/ college for further admission procedure.